What are the procedures for registration as an importer in Myanmar? How to start an import business in Myanmar? How to get import licence in Myanmar? What are the certification formalities to import to Myanmar? How to get the status of an importer in Myanmar? This post explains about import registration procedures to be obtained from Myanmar government authority for importation to Myanmar. All natural persons or legal entities are approved to conduct export and import process in Myanmar. For commercial purpose, a company must register itself with the Directorate of Investment and Company Administration (DICA) and with concerned license (if required) as per the business. Once registered with the DICA, a company must then register themselves with Myanmar’s Department of Trade (under the Ministry of Commerce). All exporters and importers are also required to join the Myanmar Federation of Chambers of Commerce and Industry. The vast majority of imported and exported commodities require a license in Myanmar. This information is about import licensing procedures to import goods to Myanmar. If you have to add more information about import permit and registration required to import goods to Myanmar, share below your thoughts. Import registration procedures required in SITTIVE . 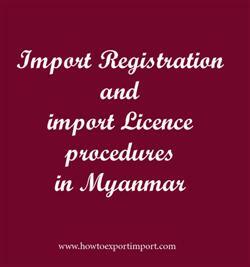 Import Licence process in YANGON. Process to import to Mandalay. Requirements of registration to import to Mandalay. Registration requirements in SITTIVE to import. Registration needed to import to YANGON. How can I register to import in Mandalay. What Licence requited to import in Mandalay. What should I do to import goods in SITTIVE . How to get import licence in YANGON. Procedure to get registration to import in Mandalay. Mandatory process need to complete import in Mandalay. First permission required to import in SITTIVE . How can I start import business YANGON?. How to begin import trade in Mandalay? Permission to initiate to import in Mandalay. The way to get registration to import in SITTIVE .